Facility Ratings platform helps carriers choose better loads, shippers improve their sites, firm says. Freight matching app provider Uber Freight has launched a feature that allows carriers and their drivers to share ratings about the cargo facilities they visit, a function the firm says will help drivers decide whether or not to book loads with certain shippers. While shippers will not be able to edit or contribute to these ratings of their sites, the data generated by this Facility Ratings platform could provide them with brutally honest insights that could help them make positive changes and improve driver experiences, Uber Freight said in a blog post today. "Despite the amount of time drivers spend at facilities, they don't always have the opportunity to share their experiences with those who have the power to improve it," the company said. "Truck drivers spend a lot of time at facilities. It's where they go to pick up and drop off their freight shipments, and often where they spend the night after a long day of driving. Detention time, bathroom access, and parking availability are all factors that either incentivize or discourage drivers from choosing loads at a given facility." 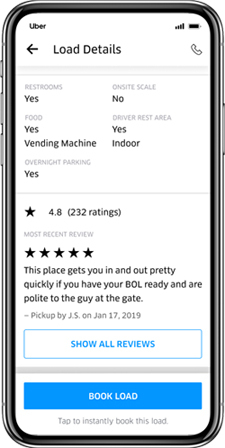 Drivers can now use their smartphones to rate facilities on a scale of 1 to 5, with the option to leave a written review. Those ratings—along with details about a facility's amenities—are publicly available to all Uber Freight users. "Detention is something drivers care a lot about," Xinfeng Le, Uber Freight's Carrier Product Lead, said in an interview. "Whether they are delayed at a location, or if they are running low on their hours under the ELD mandate and need to know whether a facility offers overnight parking, this can help them plan their day much better." According to Uber Freight, the Facility Ratings feature is the latest example of its effort to close a disconnect between shippers and carriers by making the trucking industry more collaborative and transparent. Previous initiatives have included launches like Uber Freight for Shippers and the firm's Freight Insights. Of course, Uber Freight is not alone in launching products intended to improve supply chain visibility. On Tuesday, the third-party logistics provider (3PL) Transplace released its "Weekly Supplier Performance Benchmarking Report," a rating it says will help shippers meet the delivery requirements set by major retailers. The report, which currently includes data gathered from 28 suppliers of major retailers, identifies delivery performance statistics such as late, early and in full shipment percentages, all anonymously compared to other shippers participating in the program. Also this week, the Port of Oakland added harbor trucker turn times to its online portal, saying the feature tells drivers how long it takes to pick up or drop off their cargo and answers industry demand for timely supply chain performance data at U.S. ports. Before the launch of these data-sharing platforms, drivers used a collection of social media sites to trade information about facilities, amenities, and infrastructure, Kate Kaufman, Director of Account Ops at Uber Freight, said in an interview. But these new portals offer a single, central repository for the information and create a product that can benefit both carriers and shippers alike. According to Kaufman, carriers will use the data to make more informed decisions about whether to take a particular load, while shippers will welcome the new source of feedback because it will empower them to improve conditions within their supply chains. "Shippers say 'I can't control a snowstorm or a bridge being washed out in a flood, but I can control the conditions in my own facility.' So this will be an actionable tool for them, a lever they can pull," Kaufman said. Feedback: What did you think of this article? We'd like to hear from you. DC VELOCITY is committed to accuracy and clarity in the delivery of important and useful logistics and supply chain news and information. If you find anything in DC VELOCITY you feel is inaccurate or warrants further explanation, please ?Subject=Feedback - : Uber Freight app now lets drivers rate shippers' facilities">contact Chief Editor David Maloney. All comments are eligible for publication in the letters section of DC VELOCITY magazine. Please include you name and the name of the company or organization your work for.